Infrared radiation is a type of electromagnetic radiation, positioned to the red end of the electromagnetic spectrum. One of the most useful applications of the IR spectrum is in sensing and detection, which is why it is applied to interactive touchscreen technology. Using LEDs and infra-red light sensors, placed on the vertical and horizontal axis of a bezel, the system casts an invisible grid of infra-red beams across the screen. 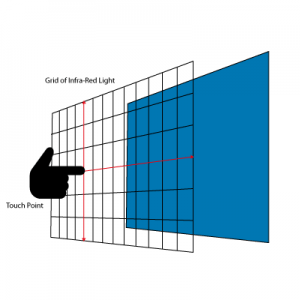 When an object (finger, pen or other solid object) touches the screen, it breaks the light beams on the grid, blocking it from the sensor. 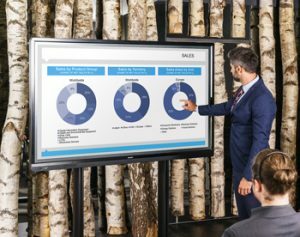 Sharp’s infra-red (IR) touch gives incredibly fast and responsive touch experience, that generates user confidence to ensure the BIG PAD interactive touch screen is a natural tool and asset. In contrast, the older types of touch technology in interactive touchscreen boards didn’t use infra-red technology. These boards used resistive technology, which is commonly seen in smartphones and PDAs. This allows the board to process the movement of a finger or pen when it touches the surface. However, without the infra-red technology, any movement of the board or projector would lead to the need for calibration. over time. Sharp’s interactive touchscreen devices all use infra-red touchscreen technology, with the exception of two devices that have ‘P-CAP Captive Touch’. The PN-40TC3 and PN-80TC3 screens have no need for infrared surround, making the screen larger than their infra-red counterparts. Instead, of IR, conductive wires are layered in rows and columns on two parallel sheets of glass. Wherever the screen is touched by a finger, the controller identifies the change in the electrical capacity in the grid of wires. P-CAP screens can recognise multiple touch points. This advancement in technology has resulted in a vast improvement in touch accuracy. Additionally, unintended and false inputs are almost completely eliminated and the delay between touch and the image appearing on screen is virtually zero.